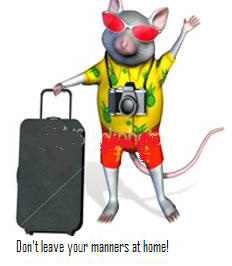 Travel Etiquette is especially important when you are away from home. You are an ambassador of your country or place of origin and need to convey a good impression of the place that you come from. Using your best Travel Etiquette is the best way to do it. So take a big smile with you. There are many modes of travel and they all have their own form of etiquette to be observed. See the links to them lower down the page. But if you are always kind and considerate towards everyone and do not put your own selfishness ahead of the rest, you will do alright. The following will help you to more precisely practice travel manners in various situations. Observe local customs as far as possible. Read up about the country or place you will be visiting before you leave home so that you do not come across as rude, arrogant or indifferent. Gratuity is common in most countries so you better tip, most especially if you receive good service. Giving tips in casinos is customary, so handing some dollars to your dealer for each winning hand wouldn’t hurt. If you want to avoid tipping, play casino online or play in countries like Australia where it is considered bribery. Locals will be more helpful to a friendly person than to a scowling one. The exuberance of being on holiday should not allow your standards to slip. Because you can afford to travel does not make you superior to the locals. You may think you come from a better place, but better in what way? There can only be one best place and which place is that? There are many cultures and who can say which one is the best? The same goes for religion and customs and a whole load else. And, if the best of everything is back home why have you left it? In short, respect and appreciate the differences without denigrating the place you are at. Making disparaging comments only shows up one’s own superficiality. It spoils it for the others who may not necessarily agree with you but have better manners than to criticise. So create a mindset of caring and sharing with everyone you will meet on your travels and Bon Voyage.